From ball turret gunner John Dominey's Christmas 2000 letter to the crew To: The Crew. About two months ago, I made two tapes of my war story for Stephen E. Ambrose. One of the comments that was made was how proud I was of the men in the crew. 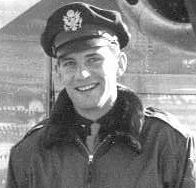 The plane had received a direct hit and when Cowboy (co-pilot Funk who was handling intercom because Greenman's intercom was damaged) asked if any one had been hit, every one answered in turn, starting with the nose gunner, Anderson. 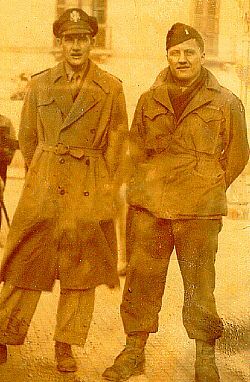 In a calm voice each answered, reporting his position, and saying OK until the waist gunner, Robert James reported two hits; then the tail gunner, Donald said OK. Cowboy asked if James could jump, he reported he could. The way each man answered, we all could have been in Sunday School, answering roll call. I sure can't explain how proud I felt to be a member of this brave crew. I still get tears in my eyes when I remember that moment in time. On the morning of a mission they would awake us around 4 am...breakfast first, then we were trucked to this large, partially underground building with rounded roof, which we called "the Pit" for briefing. The Navigators and Bombardiers had an early briefing the night before and were not to reveal the target to the rest of the crew for security reasons. I think the Pit had a stage or raised platform in front. A huge map was up front, usually covered with a curtain when we entered. When the mission was announced they would pull the curtain back to show the map, which had strings on it showing the flight paths to the primary and alternate targets. You could hear a sigh of relief if it was an easy target, or a groan if it was a tough one. Briefing was usually done by the operations officer, weather officer, and perhaps lead pilot. We would then go to the supply room to check out our flight equipment, parachutes, flak vests, helmets (we pilots seldom used flak helmets, but gunners did sometimes. We did check the flak helmets out occasionally and put them on the flight deck and only put them on when on final leg over the tarket. They, I believe were used more when enemy fighters were a real problem.) No one ever questioned if the parachutes had been checked...we just assumed it. It seemed everyone developed an attitude that it was always the other guy that might have to use one...never me. We pilots always checked out back back parachutes...other crew members who had to move around checked out chest packs. Chest packs snapped to a harness and could be removed to facilate moving around in the aircraft. We would then go directly to our planes to prepare for take off. We usually took off at 30 sec intervals circling up to around 8 or 10,000 ft where we formed up with the squadron, then with the rest of our bomb group. Note the Red Cross girl in the picture. When we came down from a mission we were trucked to the "Pit" area for debriefing, and there was always a Red Cross girl there in a portable wagon or something giving out cold donuts…sometimes rolls...coffee, right outside of the "Pit". In addition, not sure but think she gave it out, were little paper cups of whiskey or brandy. We really needed that after returning from some missions. Helped us relax. 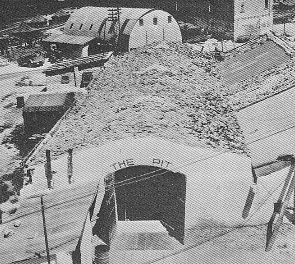 We then went back into "the Pit" for debriefing and wait for the intelligence officer or operation officer to come and ask us questions about the mission. After that, we returned our flight equipment to supply.... then it was shower and dinner and off to the officers club... if we didn't fly the next day we stayed quite late. Normally Air Transport Command ferried the new planes over to Europe and their pilots were familiar with all the airports enroute. We were not. They would show us pictures, (still and movies) landing patterns etc., the night before the flight so we would have some idea as to what to expect. From Goose Bay Labrador, we tried going into Greenland once in one heck of a snow storm. Greenland seldom had clear weather so they told us we probably would have to get under the clouds and that meant flying on the deck a long ways up this fjord (Narsarsuaq, code-named "Bluie West One" in WWII, is about 45 miles up the fjord!--see right). At the end of fjord is the airfield with a huge mountain right behind it (see below). In our case we didn't know how much ceiling there was and with the snow we figured it would be pretty low. We let down over the ocean and never broke through the clouds so Greenman, Ted, and I decided it best to turn back. A wise decision. We were on instruments most of that flight...think total flight was about six hours. I know we were concerned about fuel on return to Labrador. When weather broke some days later, we got extra gas (probably bomb bay tanks) and headed straight for Iceland bypassing the stop at Greenland. 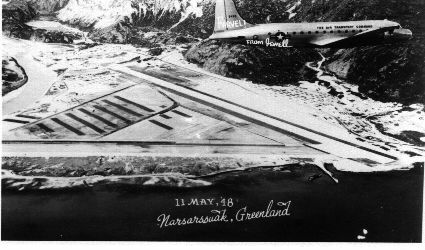 Narsarsuaq or "Bluie West One", with mountain at end of runway. Not a good place to miss an approach! 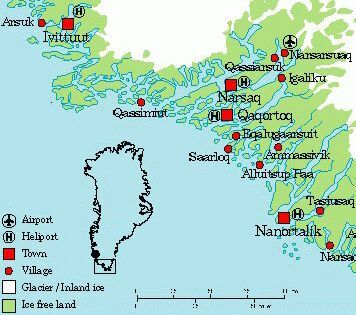 Famed polar aviator and explorer Bernt Balchen was based here during the war to rescue the many stranded aviators, like the crew of "My Gal Sal". There is a museum in Narsarsuaq, maintained by Soeren Svendsen, with collection of photos and stories, showing the history of Bluie West One from 1941 - 1958. Also John Stott has an impressive online photo collection and other material about BW1. Keflavik airfield, Rekjavik, Iceland. We were so happy to see that tiny air strip at Rekjavik, after our long flight over water and experience with the false radio beam that it may have clouded our impression of Rekjavik. I remember when we landed late afternoon in a drizzle and got out of the plane we sank in mud up to our ankles. The field and surrounds were miserable. I don't recall the quarters, food , officers club etc. We were very tired and scheduled to take off in the morning so turned in early. I do remember a couple of incidents. When we were eating dinner and the visiblity was terrible this B-17 came in with one engine feathered. We heard they had fallen for the fake radio beam and headed out to sea but realized their mistake. In order to stretch their gas supply they had thrown all gear, machine guns etc. overboard and just made it with one engine already out. When we were in Topeka, Kansas on the night before we took off we went to town and bought two cases of Whisky and loaded them on the plane. (Totally against regulations). We had them well hidden and so far they had not been discovered at any of the bases we stopped at. The ground crew at Rekjavik must have been experts for they found those two cases and absconded with them. We had talked about posting a crew member on the plane as a guard that night but it was such a long, rough flight decided against it. Of course we couldn't report it. Valley was a good airport...excellent facilities...quonset huts for quarters with little charcoal stoves that some older Brits kept going every day. Very nice officers club and good dining facilities. As I remember they were quite plush. Remember going to church Christmas eve in dense fog. I got to this quonset hut and opened the door and mass was in progress. I stayed until the end then discoverred it was not a catholic service but Episcopalian. I still felt good as I shook the ministers hand on the way out. Valley Wales was a very foggy location. We landed within minimal ceiling. As I remember I believe that the runways ended somewhat short of the high cliff overlooking the sea - a rather scary approach. 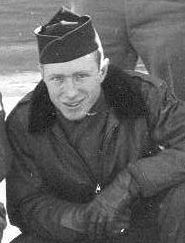 We were there about five days waiting for weather to lift and a decision if we would join the 8th air force to assist in bombing for the Battle of the Bulge. One night in dense fog they organized a volunteer search party to scour the country side as one plane coming in was missing. I remember riding in that truck through that dense fog knowing that no plane could safely land in that soup. We did not find it but next morning heard a report it had crashed. Don't know if any survivors. 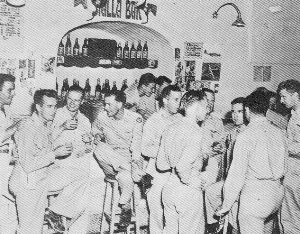 One day at San Giovanni I met Joe Kelly, also a LaCrosse boy... didn't know he was in the 15th and here he was, a pilot in the 739th Squadron (454th Bomb Group), right at the same airfield. We would occasionally go to Foggia, as it was a bigger city than Cerignola and cleaner. They used the streets for sewer in Cerignola although the population was close to 20,000. Like so many very poor Italian cities they had a huge cathedral and that was the meeting place for everyone. People would stand in back of church, in a big open vestibule and talk and talk and talk....right while mass was going on. 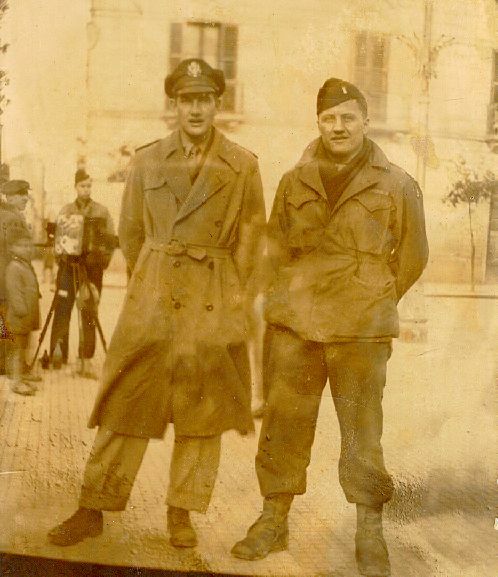 Stan Blunt, a friend of John Greenman's, kept a diary and published it a couple of years ago. He was a navigator. John got me a copy and it is neat because we flew some of the same missions, although Stan was in a different bomb group. Stan was in Italy a little ahead of us and did encounter some fighter difficulty. 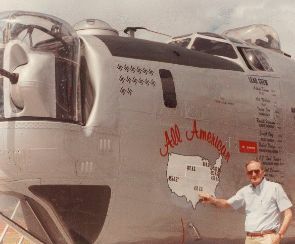 He flew on the April 25 Linz raid...and mentioned the severe flak and that we had lost one plane...guess who that was? Stan has a photo of one of our planes blowing up on our raid of April 6th. The way the B-24 fuel lines ran they were susceptable to gas explosions if you were hit in certain areas. After we took our flak hit, within seconds we had gas all over the flight deck. I remember I was wearing English RAF-style flight boots with rubber soles. Once I got up to leave the plane my rubber soles hit that gas-covered flight deck and I literally slipped right out the bomb bay, hardly touching the bombbay catwalk. We did have a good crew but also in many situations we were lucky and the good Lord was riding with us. Fortunately, we were young and perhaps didn't fully comprehend the dangers and difficulties. We were under pressue a lot of the time, but being well-trained, young and unattached (except for Pops) certainly helped. I will say we worked well together as a crew...we were a team and each one depended on the other to do his job. We survived and that is the important thing.